Don't play dumb with us, Tommy. The Jets are the subject of so much hype and, now, so much schadenfreude because Rex Ryan declares every year that his players will win the Super Bowl, crush their enemies, and hear the lamentations of their groupies. If you sign up for the role of carnival barker, you've got to expect that the suckers will light the stage on fire when the sham gets exposed. Sure, we should've recognized that the Jets were a fraud. But don't blame the victims for believing the hype that spews forth from a championship-caliber hype man. I'm fascinated to see what the Jets do with Mark Sanchez, who is just 25 years old, has made the AFC Championship Game twice, and is tied for the NFL record with four road playoff wins. When he beat the Patriots last postseason, Sanchez "was the most poised and precise quarterback on Tom Brady's field." When he played poorly in this season's final three games, writers and Jets fans were ready to send him back to whatever lifeguard stand GQ plucked him down from. Our minds tend to place passers in one of two categories: "elite" and "terrible." We have a hard time considering that some quarterbacks are going to be a little above average, or a little below average, rather than at the extremes. As we head into the first weekend of the playoffs, I'm interested in the noise emanating from New York's other franchise. "Most people, you would call them dirtbags," Giants defensive end Justin Tuck said this week, referring to his team's first-round opponent, the Atlanta Falcons. The Falcons' offensive line, in particular, has been called out all year long for alleged dirty play. The Packers' B.J. Raji said they "indulge in … cheap stuff" and that they're "coached to play after the whistle." "They'll hit you late, and around the pile they'll hit you in the back," Titans defensive end William Hayes said in November. And Detroit's Ndamukong Suh—pot, meet kettle, stomp on kettle—claimed Falcons quarterback Matt Ryan got what he deserved when he turned his ankle against the Lions. "To me it's karma for all the bad stuff they've done in the past," he said. "Their offensive lineman hurt their own quarterback." 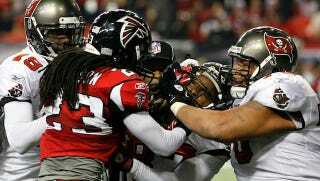 What exactly are the Falcons doing to get these defensive linemen so riled up? I just watched the Falcons-Lions game from Week 7 on NFL Rewind, and I saw a bunch of shoving after the whistle—you know, because it was an NFL game. Falcons left tackle Will Svitek also cut the Lions' edge rushers below the knees on a bunch of plays, a perfectly legal maneuver that nonetheless riles defensive linemen who live in fear of a torn ACL. Nate, what's your take on this—does the fact that so many players from so many different teams have complained about the Falcons indicate that they really are doing something that violates the NFL players' code of fair play? Could the Falcons' offensive line coach, a milquetoast-looking gentleman named Paul Boudreau, really be the mastermind of such a diabolical scheme? Come on, he wears glasses!